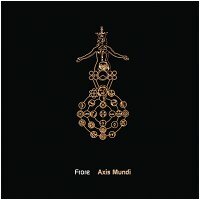 Paul Casper of Frore returns to Earth Mantra with another epic tribal ambient odyssey called Axis Mundi. Folks, we at Earth Mantra listen to a lot of ambient music, and Frore has come to be one of our favorite ambient artists ever. Consequently, we have come to expect great things from Paul when he submits a new release for consideration, and with this album he exceeded even our high expectations. A longplayer clocking in at over fifty one minutes, this glorious album perfectly highlights Paul's remarkable talent at fusing inspiring hand percussion with evocative ambient soundscapes. Thematically, the album is obviously about the Axis Mundi mythology, the turning point of the world and line through the Earth's center around which the universe revolves. Some cultures believe the Axis Mundi is a mountain, some a giant tree. Paul reports: "The idea behind the piece was exploring the climb up the Axis Mundi, or going into the Axis, depending on how you look at it. The piece starts off dark (at the base of the tree / mountain), and filled with shadows. From there it gets a little lighter, although there are still some dark elements mixed in. Finally it ends in a view from the top, or the place deep inside. Basically, it's just about getting lost in a world and going for a ride." And what a ride the listener experiences. Musically, the piece evolves at the ideal peace, flowing slowly from scene to scene without calling any attention to the movement. The ambient elements are particularly well done, with radiant swells of texture revolving effortlessly around the axis of the listener's consciousness. As always with Frore, the percussive elements delight. Rattles, clay flutes, fujara, shells and stones, rain stick, frame drums, djembe, and other percussion instruments provide a dramatic foundation upon which the entire piece rests. And the production quality amazes us. Paul has always focused carefully on the details of his recordings and his instrumentation, but he seems to have outdone himself with this album. A perfectly balanced spectrum, a spectacularly detailed mix, and a superb mastering sheen combine, a masterwork as the result. Listeners will notice a strong Steve Roach or Vidna Obmana influence, but to us the Paul Casper influence outshines them all. This is the music of Frore, fresh and inviting, the kind of sound journey that makes us want to listen again and again. We feel strongly that this album will go down as one of the best tribal ambient albums of 2012, and one we are exceptionally proud to bring to our listeners. In our view, nothing less than music for the ages. Hi, I just wanted to say Thank You to everyone for their comments and feedback. It's really great to know that you guys are enjoying the music. Thanks, Paul. This is without a doubt one of my favorite releases of 2012 and will be in heavy rotation in my collection. This sounds like it could be the lost 3rd disc of 'Well of Souls' by Steve Roach and Vidna Obmana. A must download!! A few years ago after listening to Biff Johnson I told Steve Roach that Biff's music was very flattering to him. Frore's Axis Mundi is also very flattering to both Steve and Dirk. Excellent stuff!